The Baby Buckle Pad® was created after a mother accidentally pinched her squirming baby’s legs while buckling her into her car seat. She never forgot what an awful feeling that was! Determined to find an aftermarket pad to purchase, she was in disbelief that there were none available- not even from the manufacturer of her baby’s car seat. So after tirelessly searching for a non-existent aftermarket pad for her daughter’s car seat; she decided to create it so parents everywhere could avoid that “awful feeling” of accidentally pinching their most precious passengers. -No more tears from accidental pinching of delicate little thighs. -No more HOT metal buckle against delicate little thighs. -No more unsightly pressure marks on skin from buckle. -Discourages buckle release from curious little fingers. -Soft, Cute child friendly pad faces up at the child. The Baby Buckle Pad® is easy to use with new and existing car seats, strollers, high chairs and baby swings. Fits 3 to 5 point harness items plus easy to remove and clean. This product is soft, cute and has a friendly face that looks up at the child. 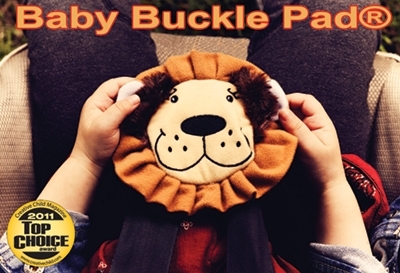 The Baby Buckle Pad® gives a safe, comfortable ride to our children! NEW BABY BUCKLE PAD® DESIGN: The Princess will be available in 2012. The Baby Buckle Pad® is a Creative Child 2011 TOP CHOICE parent award winner chosen by moms, moms-to-be and educators for Parenting Aids-Safety and Protection category! Momma Edison is expanding their product line in addition to the award winning Baby Buckle Pad®. They are very excited about this new line which will be geared to a broader audience of kids ranging in age of 5 -18 years old. Momma Edison’s new product line re-enforces a positive outlook while building self-esteem and confidence in a “cool” kid way. Available in 2012.